Spirit Nature Design at Art in Action, Waterperry House, near Oxford, was an inspirational exhibition demonstrating the creativity and vision of three furniture makers; Philip Koomen, Guy Martin and Tino Rawnsley. At the invitation of the organisers at Art in Action, an annual international showcase of artists and craftsmen who demonstrate their skills, these craftsmen put together an extensive exhibition of furniture and a building structure that explored the relationship between ethics, the natural world and creativity. In an experimental initiative a series of daily dialogues held at the exhibition space provided an opportunity, for some of the 25,0000 visitors over the four-day event held in July 2005 at the magnificent gardens of Waterperry House, to discuss the themes of the exhibition. The three craftsmen believe that design and craftsmanship must be shaped and informed by an ethical view point that recognises humankind’s unity with all things in creation and promotes the well-being of humankind, harmonised with the needs of a balanced ecology. 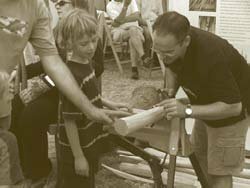 Chris Harris, of Philip Koomen Furniture, showing a youngster how to spoke shave. The exhibition demonstrated their concerted efforts to align their professional practice to this farsighted ethic. It was also an impressive logistical collaborative effort. Philip is based near Henley-on-Thames, South Oxfordshire while Tino works in Cornwall and Guy in Somerset. With only one opportunity to discuss the themes face to face their collaborative effort was sustained by shared values derived from their spiritual perspectives on life. Unusually they each commit to three different faith traditions: Bahá'í, Pagan and Christianity which have directed and inspired each of their practices. In a world where religion appears to cause conflict, these craftsmen sought a unified understanding of man’s responsibility to nature. What emerged was an ethic based on responsibility. Tino, a Pagan, described this relationship as, “engaging with nature in a participatory manner without compromising her health and diversity”. Guy, a committed Christian, emphasised the spiritual obligation of a designer to become egoless and an active listener in which the process of design focuses on, “service rather than self”. Philip, a Bahá'í, believes that we can only be reconciled with the natural world and humankind by developing an ethic based on being a world citizen. This must be the ultimate expression of the ‘Golden Rule’, of ‘Love thy neighbour’, expressed in all religions. Eolis building structure module with the original model showing underneath. The exhibition therefore derived its theme from a desire by the exhibitors to begin to explore the dynamics between ethics, nature and creativity. The dialogues became a vital link to engage with the public on the issues in a real and meaningful way in which all parties adopted an attitude of learning. The visitors were greeted by Eolis, a modular building structure that stood colossus-like near the entrance. 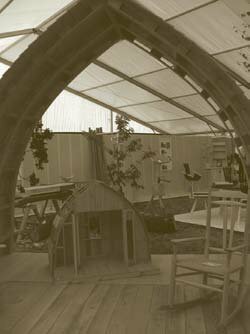 Guy and Tino had worked together on designing and building this eco-structure which had been inspired by A-frames and Bowform buildings. Motivated by the opportunity to exhibit the experimental project at Art in Action, Tino provided the production facilities and Guy developed details; both worked out the problems together. Guy also brought to Art in Action a range of furniture designs that use coppice ash and willow harvested near his workshop. These designs have a striking sculptural quality and are structurally refined, reminiscent of vernacular furniture, yet boldly modern. Philip’s work was wide-ranging, indicative of thirty years of designing and making furniture working with an experienced team of craftsmen. The central piece was his wildly organic Pondlife bench made from sweet chestnut thinnings. Chris Harris, one of his assistants who produces the benches, enjoyed sharing his skills with the many young people who eagerly grasped the opportunity to practise spoke shaving on one of the carved reeds that go into the design. The extensive selection of furniture Philip exhibited was only in one sense the tip of the iceberg. Over the last five years he has been developing a strategy that integrates the experimental development of furniture designs that explore the possibilities of under utilised locally sourced timber with the creation of a microinfrastructure to facilitate the selection sourcing and processing of the timber for his furniture designs. He originally approached thirteen local woodland owners and forest contractors and so far has worked with six to purchase timber for an evolving range of designs that have taken on distinctive forms, like the Pondlife bench. Each design celebrates the characteristics of fungal attack, more unusual timber shapes, knots and cracks and distinctive figure. Philip also wanted to demonstrate the potential viability of local sourcing. Throughout the project he has been working with David Rees at the Oxfordshire Woodland project and they both hope they can promote the establishment of a cooperative between woodland owners and timber users to source and process an under-utilised resource. Exhibiting exciting new designs, demonstrating techniques and engaging with discussions with the public through the daily dialogues generated a palpable energy at this exhibition. The thousands of visitors were clearly engaged with what they saw and receptive to what they heard. Tino, Guy and Philip, were encouraged by the input from the public and would like to develop the dialogues in the future. What began as an experiment, through the patronage of Art in Action, emerged as a potentially dynamic new form for public education. The traditional debates and presentations by technical experts and academics was replaced by practitioners engaged on a daily struggle with grass roots issues with global implications willing to share their successes and failures.